The latest findings add to long-standing concerns about these important pollinators' health. TAMPA - A new study that allowed humans to spy on bumblebees inside their nests showed that pesticides can impair social behavior, making it hard for bees to eat and rear their young, researchers said Thursday. Previous research has shown that the common class of pesticides known as neonicotinoids can harm bees' ability to forage outside the nest. Researchers tracked the changes in bees' behavior by placing cameras inside 12 specially made boxes that contained one chamber for a nest and another chamber for foraging. Some bees were exposed to concentrations of the neonicotinoid imidacloprid similar to that expected in the environment. Others were not. They found the pesticide-exposed bees were less social in a variety of ways than control bees placed in similar boxes but not fed nectar that contained neonicotinoids. "Exposure to the neurotoxic pesticide resulted in measurable changes in worker bee behavior within the nest," said the report in the journal Science. "The workers were less active, less likely to feed and care for larvae, and more likely to be found towards the periphery of the nest." The effects were particularly noticable at night. "Bees actually have a very strong circadian rhythm," said lead author James Crall, a postdoctoral fellow at Harvard University. "So what we found was that, during the day, there was no statistically observable effect, but at night, we could see that they were crashing." Experiments also showed that pesticide exposure made it more difficult for bees to regulate their body temperature, and to build a protective wax cap over the colony. "Almost all of our control colonies built that cap," Crall said. "And it seems to be totally wiped out in the pesticide-exposed colonies, so they lose this capacity to do this functional restructuring of the nest." Researchers said their findings add to mounting evidence of the harm posed by neonicotinoid pesticides. 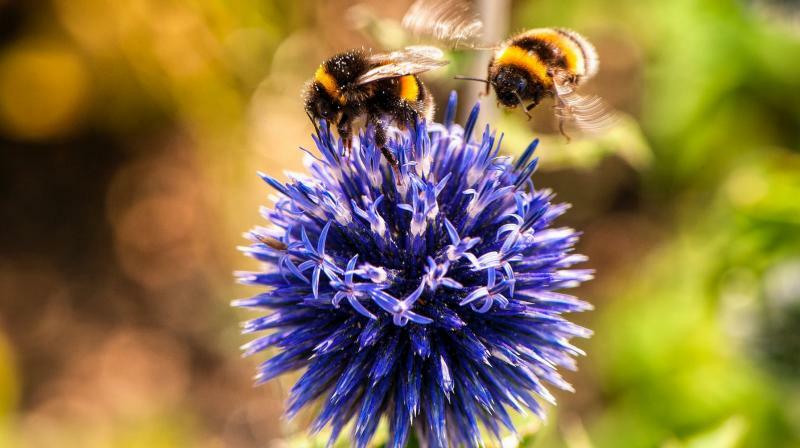 The European Union has voted to outlaw the use of three neonicotinoids -- clothianidin, imidacloprid and thiamethoxam -- in crop fields. France has gone even further and banned these three neonicotinoids plus thiacloprid and acetamiprid, both outdoors and in greenhouses. In recent years, bees have been mysteriously dying off from "colony collapse disorder," blamed partly on pesticides as well as mites, viruses, and fungi. The United Nations has warned that 40 percent of the planet's insect pollinators, particularly bees and butterflies, risk global extinction, which would have serious implications for food production and ecosystem health.